The Frenchman's Food & Wine Blog: The cheapest edible Chinese food in Perth! There's this uni student hangout in the recently renovated Village Green shopping centre in Karawara, at the corner of Manning Road and Kent Street, just across the road from Curtin University. It's called O'Mama. Not sure how the Irish influence got into the naming of the restaurant. 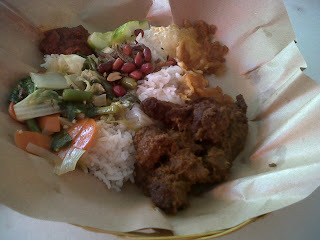 I ordered a beef rendang with nasi lemak (which really just means coconut rice). I had to wait at the counter for a good 5 or 6 minutes while the boss lady chatted on the phone to someone who was apparently trying to sell her something. The sign at the counter set the tone that this was well and truly a discount uni student joint - it warned that if you wanted extra servings of condiments, like sambal, ikan bilis (dried and fried anchovies - really yummy) or peanuts, you had to be prepared to pay for it, as refusal can be unpleasant! All the food comes from trays sitting in a bain marie. But it's a nice touch to get it in a rustic looking basket lined with waxed paper. The lady serving me asked me whether I wanted extra vegies. This appeared to cost $2 more. As you can see, it's a paltry serve. The coconut rice was nicely cooked - fluffy but not sticky or gluggy, and not dry or crunchy either. The only catch - there was only a hint of coconut flavour. Oh well, when you're paying $4.80 for a meal, you can't really complain. However, when you get slugged with an extra $2 or so for less vegies than you can hold in the palm of a child's hand, well that's a different story. If you want a cheap but tasty $4.80 meal, go for one of the advertised specials on the list, but be warned that if you want more, it will add up quickly. Compare this to lunch I had during the same week at Tina's Kitchen, which came to around $13 a person. This included a cooked to order fried kuay teow with seafood and extra egg, a 600ml bottle of water and a teh tarik.